I wore this berry swing dress the other day and the it’s currently sold out but random sizes can pop back in stock. I’ve also seen a few in the sales racks in case you want to check your local store. In other news, one of my insta friends informed me that her gingham drop waist dress dress shrunk even though she washed and air dried it. I had washed my dress the same way and I finally steamed mine out tonight which worked for the outer lining of my blanca dress but my gingham dress is now shorter than I would prefer. I may also try this baby shampoo or hair conditioner soak. I popped into my local store yesterday at Harvard Square to see if they had any new arrivals and here are a few fitting room reviews. This new lace shift dress has a similar, loose fitting style as the lace shift dress I reviewed here in size 0P. The rosebud blush color washes me out so I have my eye on the navy blue color as seen in this clip I saved from my snapchat (username: whatjesswore). 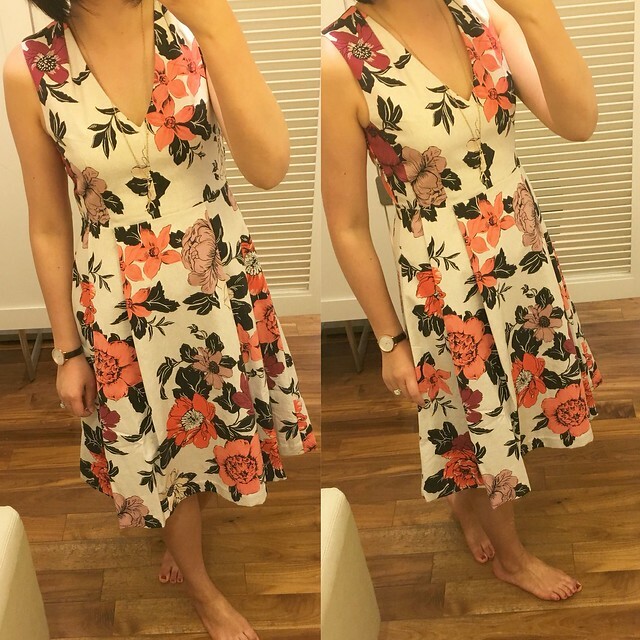 I decided to try on this lovely sundrenched floral flare dress. Size 0P has a generous fit and the v-neck is lower that I prefer so I’d recommend going down a size for this dress. 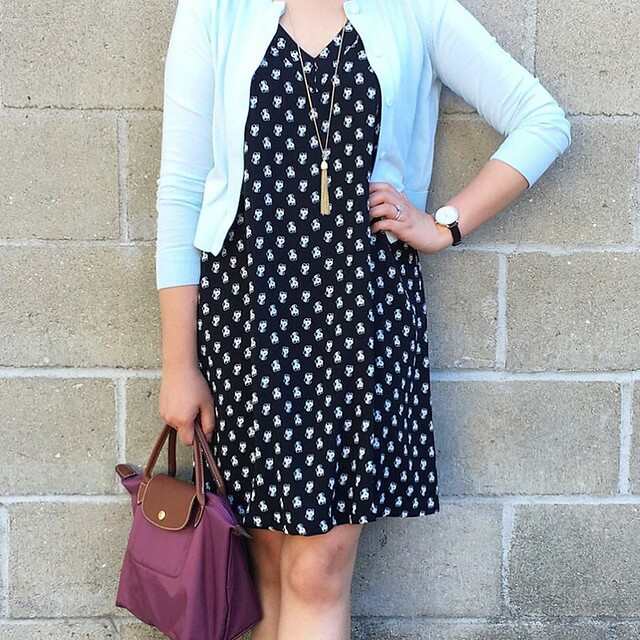 I came across this all-season stretch one button jacket in the sales rack and it was only available in size 00P. 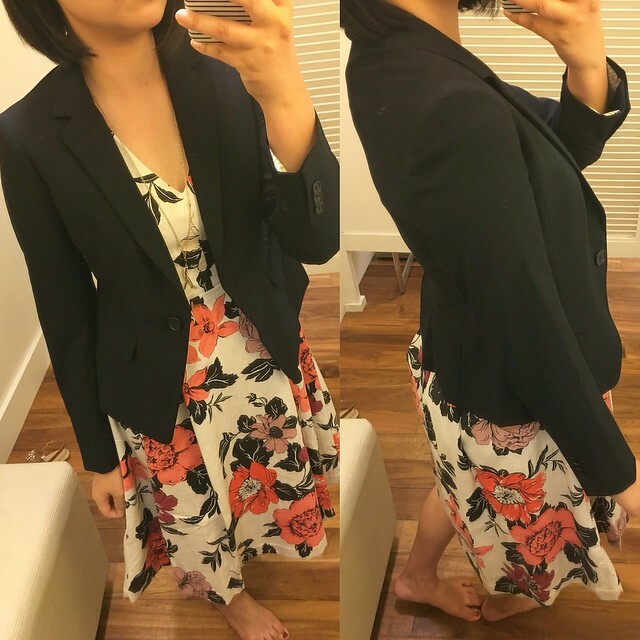 This blazer runs a bit big since size 00P fit me pretty well but I would have loved to try 0P for comparison since it flares out a lot at my hips. It’s currently on final sale for about $51 after discounts. I really like the subtle peplum hem on the back of the jacket. 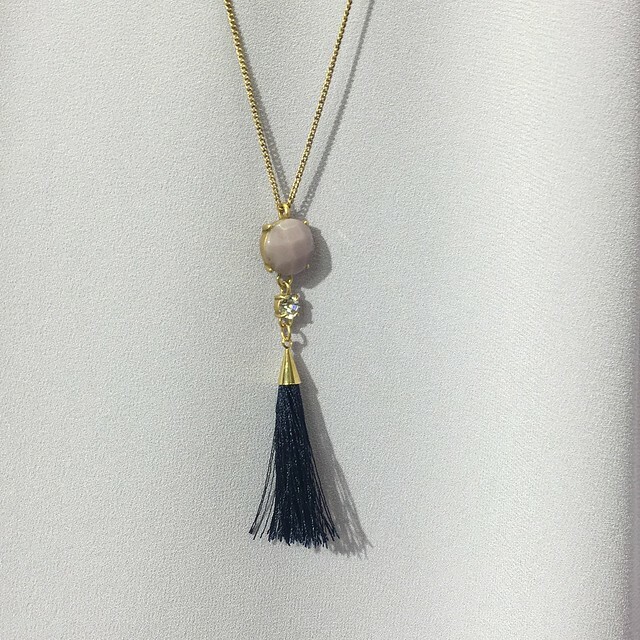 I saw this crystal tassel pendant in person yesterday and it’s exactly as pictured online. They paired it with the lilac trapeze dress which I couldn’t find in petites to try on. I tried on these Kelli patent bow pumps to satisfy my curiosity and I noticed that the blush pink is the same color as the Charlie Patent Bow Pumps (review here, last seen here). They run true to size for me in my usual US size 7 but since the ankle straps are not adjustable they may run a 1/2 a size bigger for others. The ankle straps may also be too loose if you have thin ankles and narrow feet. The lower 2.5″ heel height is very comfortable. I also saw the three new color options for my favorite ruffle sleeve pintuck tee (review here, last seen here) and I’m glad I did because I was able to cross the bird print off of my wishlist. The print looked like it would wash me out and you can see both the bird print and spotted print ruffle blouse in this clip I saved from my snapchat. I picked up these gorgeous Nine West Adalina pumps from T.J. Maxx last week and I love how they look on. They were also only $34.99 which is a great price since they look like expensive designer heels. I also bought them in a grey suede which I returned because I was struggling to figure out what to wear with them. Update 7/24: Please check out my snapchat for some live updates regarding the #NSale. I’ll try to work on a updated post tonight of my try-ons in detail. I finally got around to checking out the Nordstrom Anniversary Sale now that it’s open to the public and I ordered a few things from my wishlist this morning. By the time I checked out, the Vince Camuto Feina booties and the Caslon draped utility jacket (also available as a vest that’s not on sale) sold out in my size yet again. I only managed to order this Socialite cowl neck shift dress (as seen on Jules), these Vince Camuto Katleen booties in prairie dust suede (I am hoping the toe opening isn’t too generous), this Caslon texture wool wrap scarf in grey opal and this Caslon stripe wool wrap scarf in the olive combo. FYI. My favorite BP fringe infinity scarf (last seen here) is back and available in fall colors. If the color you want is out of stock you check back again later in case it is restocked.